يشكل فندق Cable Beachside Villas بموقعه الممتاز في منطقة رومانسية, شواطئ, سياحة ضمن مدينة برومى، مكاناً ملائماً لقضاء العطلة بعيداً عن عجقة أيام العمل. يقع الفندق على بعد 5 km من مركز المدينة، ويؤمن الوصول إلى أهم مراكز المدينة. سوف يعشق النزلاء موقع هذا الفندق، فهو قريب من أهم المعالم السياحية في المدينة كمثل Willie Creek Pearls Cable Beach Showroom, ‪Buddha Sanctuary‬, مطار برومى . إن Cable Beachside Villas حريص على توفير الراحة للنزلاء، فلا يوفر الموظفون جهداً في تقديم أفضل الخدمات وضمان حسن الاستقبال. يقدم الفندق فرصة للاستمتاع بشريحة واسعة من الخدمات بما فيها: واي فاي مجاني في جميع الغرف, مكتب الاستقبال على مدار الساعة, تخزين الأمتعة, واي فاي في المناطق العامة, صف السيارات . تتضمن كل غرف النزلاء وسائل الراحة والتسلية المصممة خصيصاً لضمان الراحة القصوى للضيوف. إن حمام سباحة خارجي, صيد السمك, حديقة هو المكان الأمثل في الفندق للاسترخاء وتفريغ طاقتك بعد نهار طويل. إن كنت تتطلع إلى إقامة مريحة وهادئة في برومى، فستجد في Cable Beachside Villas بيتك الثاني. We enjoyed a delightful stay in a 3 bedroom apartment. There was everything we needed washing machine, air con and ceiling fans in each of the bedrooms. 2 bathrooms are great for larger groups. Apartment super clean and comfortable, owners very accommodating. Public transport at front door, plenty of places to eat in walking distance and cable beach 5 mins walk. 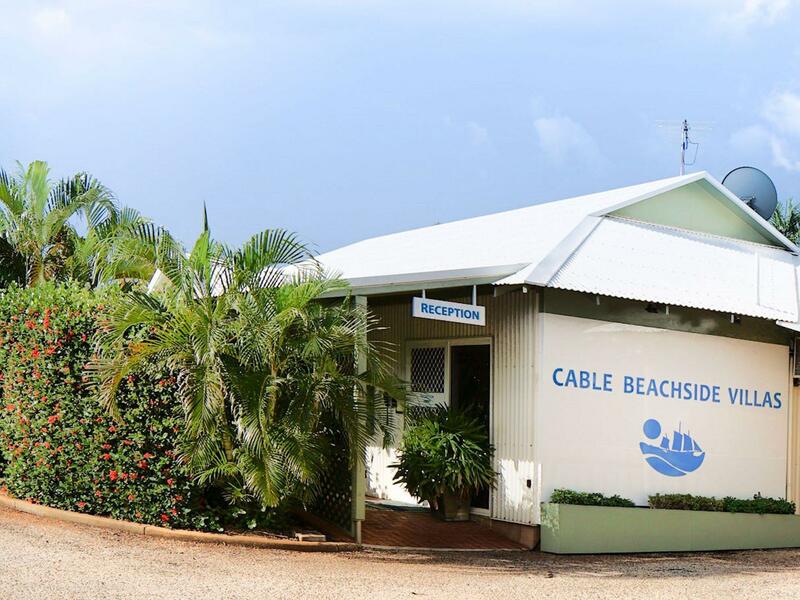 Located just a 10 minute walk from the beach, and right on the bus stop Cable Beachside Villas are perfectly located to enjoy Broome. The villas are spacious with all mod cons - everything has been thought of to make our stay comfortable. If we're lucky enough to come to Broome again, we'll be looking to stay here again. a clean and tidy villa. Set up like a home away from home. enjoyed the swimming pool, friendly staff and good pub next door. will be staying again with kids over school holidays. Pillows are tooo hard. But everything else is absolutely fantastic. Will def stay again. Take swimming towels with you. Grt private accom. We stayed in 3 bedroom self contained apartment. Second time staying here. Pub next door, mini golf afross the road, beach at the end of rd. Very happy. Perhaps something small, take beach,pool towels and the pillows are either hard or massive. If you can live with this. Book now. great place in a great location. every cupboard has something you might need but probably forgot! An extremely enjoyable stay of 6 days - good pool and BBQ facilities and the duplex villas are very quiet. Although somewhat remote from town (but very close to Cable Beach) the local bus service is very efficient. The cafe/store and Divers Tavern adjacent to the Villas are very convenient. every nice and afforderble, great for familys, kids will like it.